which in French translates to 'without worry'. It has the original rosewood finger-board with 18 original brass frets. The spruce top is now sound with 2 fine shrinkage repairs. The back is sound but with seam repairs. The tuners and tail are originals, the rosewood and bone bridge is new. 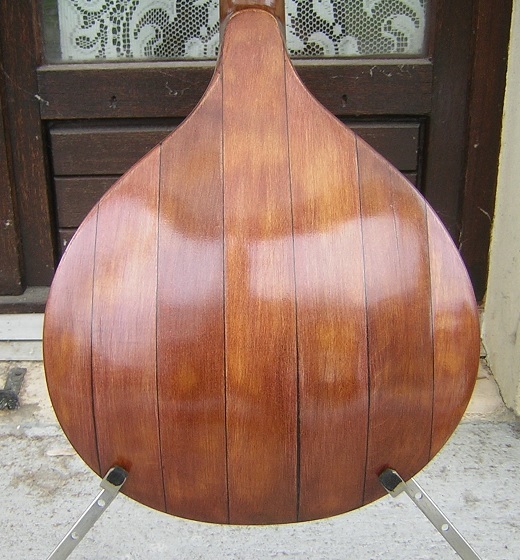 The instrument has been completely refinished with Tru-oil. It has been strung as a traditional waldzither in open C (cgceg) and is now playing well with a full, ringing, sonorous sound and a light action. Other than cleaning, I have carried out the following work on this instrument: 1) repaired 2 shrinkage cracks in the top; 2) refinished throughout with shellac and Tru-oil; 3) reset the neck angel and refitted the fingerboard for better playability; 4) reglued several open seams in the back and re-enforced inside; 5) made and fitted a new rosewood and bone bridge; and 6) strung and set up. NB. the instrument can be retuned in a variety of different ways. 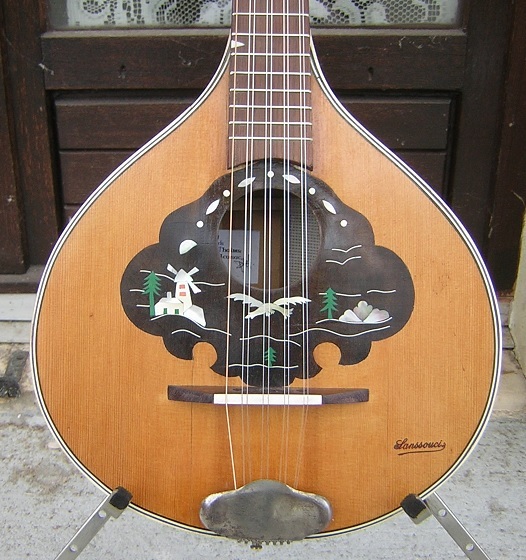 In the German region of Thüringen, the cittern seems to have existed in a time warp throughout the 17th and 18th Century. While citterns elsewhere went through a number of changes, the Thüringer remained very much the same. 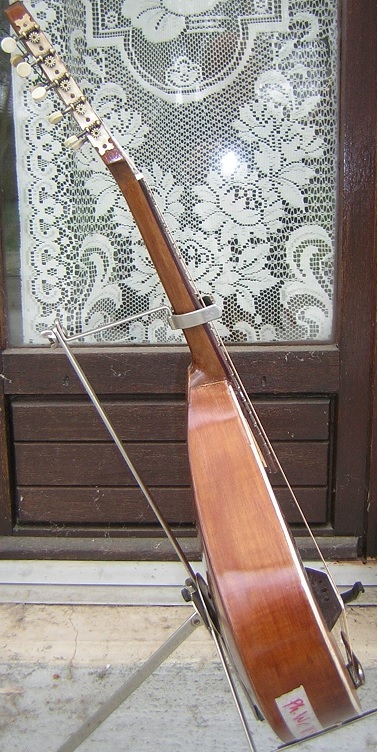 There were a number of variants with more strings, but the basic nine-stringed early 19th Century Thüringer Zither was very similar to the "standard" renaissance cittern. During the 19th Century the instrument became known as the Thüringer Waldzither and eventually the reference to Thüringen faded out and the instrument became known simply as the Waldzither, literally ‘forest cittern’. Refinished throughout in shellac and Tru-oil. Good quality, close grained, book-matched, spruce. 2 shrinkage repairs. Purfling, edging in good condition. 7 piece, domed back, in stained maple. Several seam repairs. Single-piece, stained, neck and head, probably maple. Neck angle reset. Original in rosewood, reset. 18 new frets. ivory position markers. Original bone nut. Original steel and brass tuners, all working, but a bit stiff. Original, in steel with 8 string hooks, and a strap post. Somewhat tarnished. New rosewood and bone bridge.